Madd Hatter's Kitchen » First recipe with my home-grown brussels sprouts! First recipe with my home-grown brussels sprouts! This weekend, after 10 months of growing, I finally harvested my brussels sprouts, one of the first vegetables I planted in my garden. We yielded a little over 4 pounds, so it was time for me to find some new, delicious recipes to try out. 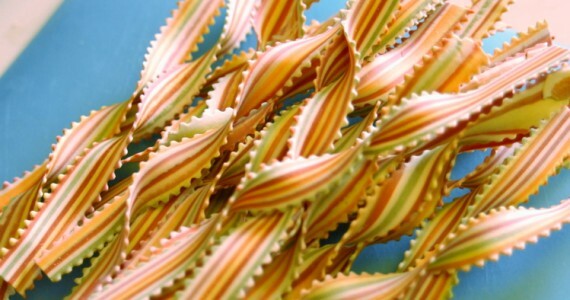 A while back I remembered seeing a pasta with brussels sprouts, and since I just picked up a box of Mother-In-Law’s Tongue at World Market (beautiful, striped pasta – like a candy cane, only better! ), I thought this might be the perfect recipe to search out. 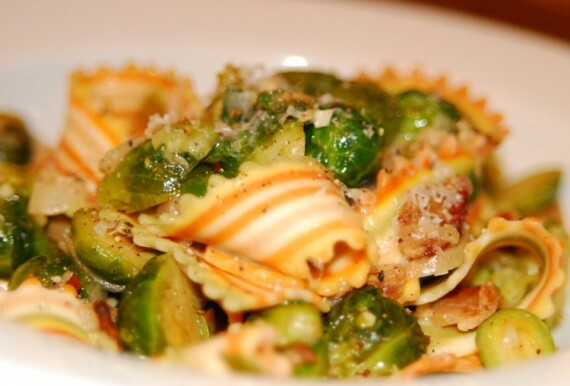 Unfortunately I couldn’t find the pasta I was thinking of, with shaved brussels sprouts, but admittedly, I didn’t try too hard because I stumbled upon this recipe at Martha Stewart for a pasta with bacon and brussels sprouts – one of my favorite pairings! Two things I will note, in her original recipe she calls for olive oil to be added to the bacon fat if there’s not enough – but I can’t imagine that being a problem with the amount of bacon called for. The second thing is next time I might cut down a bit on the cheese. As it is, I used a scant 1/2 cup, and I think a quarter cup would have done nicely. Heat a dry large skillet over medium heat. Add bacon; cook, stirring occasionally, until crisp, 5 to 7 minutes. Using a slotted spoon, transfer to a paper-towel-lined plate to drain. Leave about 2 tablespoons of bacon fat in skillet. Add garlic, shallots, and sprouts; cook, stirring occasionally, until pale golden, about 3 minutes. Add stock; season with salt and pepper. Cook until most of the liquid has been absorbed and sprouts are tender, 10 to 12 minutes. Meanwhile, bring a large pot of water to a boil; add 1 tablespoon salt and the pasta. Cook according to package directions until al dente. Drain, reserving 1/2 cup cooking liquid; return pasta to pot. Stir in sprouts mixture, reserved 1/2 cup cooking liquid, and cheese. Drizzle with 2 tablespoons oil; add sage and bacon. Toss until combined. Serve with more cheese. omg! just discovered your blog. A culinary jungle of amazing! 🙂 Haha. Regarding the chicken – you could probably do that. I would probably start out with a tablespoon each of butter/olive oil, season the chicken well, and saute. 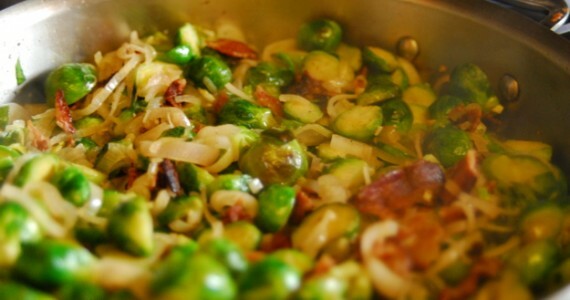 You’ll need to use a good amount of salt on the brussels sprouts to make up for missing salt from the bacon. And any pasta should be fine – the original recipe called for rigatoni. very interesting; will try it out !